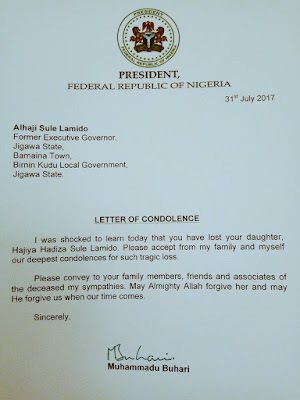 LETTER OF CONDOLENCE from President Muhammadu Buhari to former Governor of Jigawa State, Sule Lamido over the death of his daughter, Hadiza. Well done sir, how are you doing? When are you coming home? Sir did you need to send him a letter?